Springfield Municipal Offices are located at 840 Boonville Street, Springfield, MO 65802; phone: 417-864-1000. Photo: Edward M. and Della C. Wilhoit House, ca. 1916, 903 South Weller Avenue, Springfield, MO. Listed on the National Register of Historic Places in 2004. Photographed by user:AbeEzekowitz (own work), 2010, [cc-by-3.0 (creativecommons.org/licenses/by/3.0)], via Wikimedia Commons, accessed April, 2017. 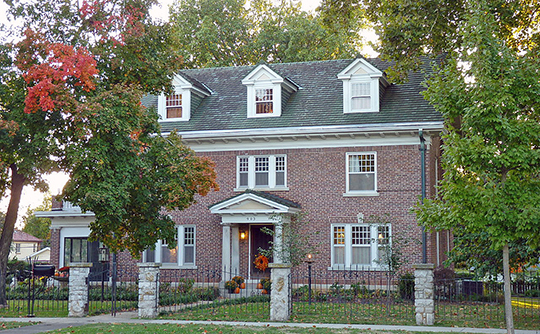 Multiple historic properties were entered on the National Register of Historic Places in 1999 and are collectively referred to as Historic and Architectural Resources of Springfield, Missouri. The text, below, was adapted from a copy of the original nomination document. Springfield is located in the southwest section of Missouri and is the seat of Greene County. Springfield is the third largest city in the state and in 1990, had a population of just over 140,000 residents. In the late 19th century Springfield developed as the major rail, manufacturing and industrial center of southwest Missouri and has remained the prominent city in the region into the 20th century. Springfield has an extensive commercial heritage which is reflected in its built environment. Springfield began as a pioneer settlement on the edge of the western frontier in the early 19th century. Its initial commercial development consisted of businesses such as blacksmiths, millers, carpenters and other enterprises necessary to support a pioneer town's existence and growth. As the town matured, agriculture along with a few individual entrepreneurs began to shape the local trade. But over time transportation by far had the largest impact on Springfield's urban, commercial, and industrial development. From a stage line, to the railroad, and eventually US Route 66, various avenues of transportation transformed what originally had been a crossroads of Native American trails into a regional trading and distribution center. Kickapoo, Delaware, and Osage tribes, occupied what is now southwest Missouri before white settlement began there in the early 19th century. As explorers pushed the boundary of the frontier westward, demand for the land increased, and the government removed the Native Americans soon after Missouri became a state in 1821. Adventuresome pioneers heeded the call of those who touted the land as beautiful and fertile, and they set out from Kentucky, Tennessee, and North Carolina in search of a fresh start. Among those seeking a new life was John Polk Campbell from Maury County, Tennessee. Having traveled through southwest Missouri in the mid-1820s, Campbell returned in 1830 with his family and slaves to settle there permanently. Arriving about the same time were William Fulbright, A. J. Burnett, Joseph Rountree and their families. They built homes, cleared the land, sowed crops and soon established a small but thriving community, which included some basic commercial enterprises. Junis Campbell, John's brother, started the community's first store in 1831. Blacksmith shops, cabinet makers, millers, and additional dry goods merchants soon followed his lead. Residents also added a schoolhouse and a church, revealing their intentions of establishing a permanent home for themselves and future generations. By 1833, nearly one hundred families lived in the area, a sufficient enough number to warrant the establishment of an independent county. Citizens chose the name Greene County, after Revolutionary War hero Nathaniel Greene, and selected John Campbell as county clerk and his brother Junis as the county treasurer. John Campbell continued to be a key figure as he donated fifty acres around the public square to establish the town as the county seat. In 1836, the townsite was surveyed and platted, and lots were sold. Campbell's design for Springfield was based upon his home town of Columbia, Tennessee and had a central public square with the streets radiating from the square in the four cardinal directions. Two years later the town of Springfield was officially incorporated and contained some three hundred residents. The main arteries in town were Boonville and South Avenues, which led north and south from the public square, and College and St. Louis Streets, which traversed east and west. Olive, Walnut, and Mulberry Streets were major surrounding avenues. In the following two decades, Springfield grew steadily. The first bank, a branch of the Missouri State Bank, opened in 1845 and provided capital for new businesses. Early industries included the carding of wool for homespun cloth and the tanning of hides for leather. A horse powered carding machine was in operation east of the Boonville Avenue Bridge and a tanning yard existed on the west side of Boonville Avenue, which spawned other endeavors like the making of boots, shoes, saddles and other leather goods. Area farms provided an ample supply of produce, grains, poultry and livestock. Dry goods stores, such as the Johnson and Wilson Company, offered a variety of merchandise including hardware, groceries, books, stationery, and footwear, and for payment they accepted beeswax, tallow, hemp, and furs as well as cash. By the late 1850s a variety of shops lined the streets leading to the public square, making it the primary business district. In 1858, sixteen of Springfield's commercial establishments sold over $300,000 in merchandise. Among the many businesses were several wagon, harness and saddle shops, and a livery stable along with numerous tailors, milliners, shoe shops, and jewelers. The town was also home to two tin shops, three meat markets, two printing offices, and three confectionery stores. Those traveling through the area had a choice of three hotels and could visit Springfield's one saloon. Those deciding to stay had twenty carpenters, two brick masons, three painters, and four land agents available to help them get settled and construct buildings. Residents also had access to ten lawyers, five doctors, four clergymen, and one dentist. The town's early blacksmith shops included Cary Jamison's on West Walnut Street, and John Lair's on St. Louis Street, both of which were established ca. 1855. Around this same time Allen Mitchell and John Caynor opened the O.K. Flouring Mill on West Mill Street, and Hancock Hardin and Company began a tobacco factory on Main Street. In 1858, W. H. Worrell opened a confectionery store on the corner of College Street and the square, various planning mills were established, and the town's first foundry was opened. In 1858, the Butterfield Stage made its first run through Springfield on its route to California. This provided the already booming town with greater exposure and important connections to other regions. To advance and keep up its image as a progressive community, the town expended public funds for the first time and spent $417.39 in 1859 for street and sidewalk improvements. In 1860, Springfield furthered its connection to the rest of the world with the arrival of the telegraph. Springfield's prosperity was interrupted by the coming of the Civil War. Throughout most of the conflict the town was under military occupation and both county and city government were suspended. In 1861 the original courthouse burned, but it was rebuilt in the northwest corner of the square, where it remained until 1914. After the war, however, Springfield quickly resumed its healthy commercial activity. Rapid growth occurred and industry flourished in the form of cotton, woolen, and planning mills, foundries, and meat and grain enterprises. The influx of new residents after the Civil War resulted in the enlargement of the city limits in 1869. This annexation included the area now bounded by National and Fort Avenues, and Grand and Division Streets.